Tobacco was a cash cow for Chesterfield in Colonial Times at Bermuda Hundred. During the mid-20th century, Chesterfield cigarettes, named after Chester, were one hot brand. With the slogan “They Satisfy,” the cigarette was launched by Drummond Tobacco in 1873. In 1898 Drummond was absorbed by American Tobacco and then in 1911 Chesterfield was taken by Liggett and Meyers and eventually Philipp Morris (Altria). 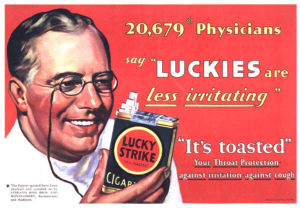 The brand was sponsor by a bevy of famous personalities: Ronald Reagan, Humphrey Bogart, Lucille Ball, the legendary football coach Paul Bryan t. And we’ve all seen the Lucky Strike smoke stack in Richmond.